3 Bedroom Town House For Sale in Sheffield for Guide Price £130,000. Only upon internal inspection can this superb split level three bedroom townhouse be fully appreciated, boasting both modern fitted Kitchen and Bathroom and newly landscaped Gardens the property is in a stones throw of nearby Sheffield Supertram networks and Crystal Peaks Shopping centre. We strongly urge an early inspection. In brief the accommodation comprises; The front entrance door leads to the Entrance Porch and in turn to the Dining Room and fully fitted Kitchen. Steps lead down to the generous Living Room with feature fireplace. To the first floor are three bedrooms and the family Bathroom with white suite. 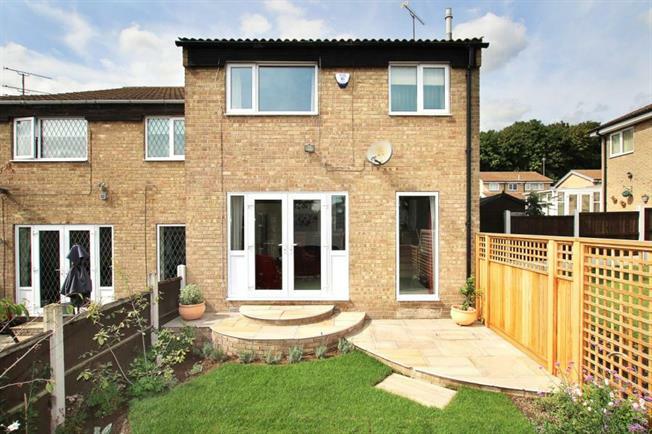 The property stands in newly landscaped gardens with a lawned front Garden area and separate detached Garage. To the rear is a delightful enclosed garden laid to lawn with patio area.